Family of European satellites launched 20 years ago to transmit television, telephone and business communications signals. Antenna allowing the satellite to broadcast radio waves to an Earth station. Section of the satellite housing the command and control systems. Section of the satellite housing the rocket engine, which maintains the position and orientation of the satellite in its orbit. Protective panels used to deflect the Sun’s rays and lower the heat reaching the satellite equipment so it will not be damaged. 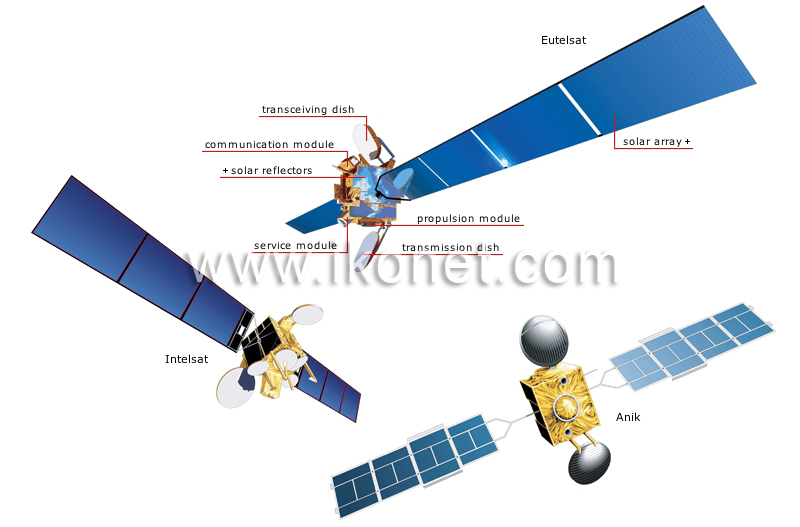 Part of the satellite that receives and amplifies signals captured by the dish and then relays them to the transmission dish. Antenna allowing a satellite to capture radio waves emitted from Earth and to redirect them to ground stations. Family of Canadian satellites. Anik A1, launched in 1972, was one of the first national telecommunication satellites. First network of international telecommunication satellites; it was set up in 1965 to ensure exchanges of telephone and television signals from one end of the globe to the other.